DML has now released a kit of an Ausf. L with the Winterketten they introduced on an Ausf. 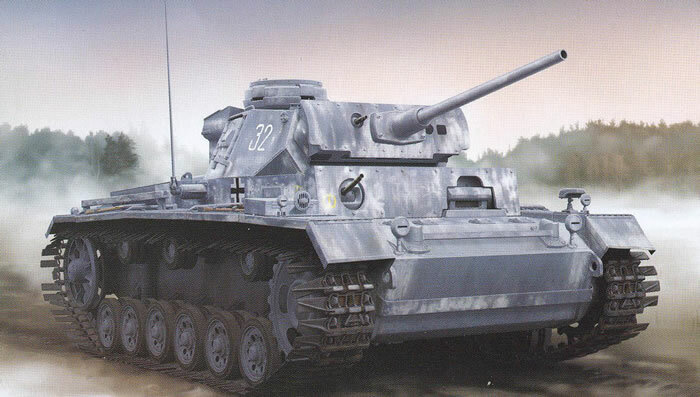 N kit in 2010 to expand their line of “Winterized” German tanks. The Winterketten are provided as “Magic Track” single links with the extended blades on the outside of the track, but this kit does not have the ice cleats as well. Other than specific parts to build the Ausf. L there is little different from previous DML Panzer III kits. As it is a late product L the hull pan has no side hatches. It retains the full torsion bar suspension from the other kit and the detailed suspension components and muffler assembly. As with the StuG all hatches are separate with some interior details and can be positioned as the modeler chooses. All engine deck ventilators are spaced and mounted on separate frames to get the correct appearance and “lift” needed to give an accurate representation of the original. The kit provides some of the options for spaced armor arrays to include the additonal armor. Options also include blackout or clear headlight lenses and the “kugel” mount for the bow machine gun. All viewports and viewers may be positioned open or closed as well. Once again this kit includes the rudiments of a turret interior, which is accurate as far as it goes. As noted this kit offers DML “Magic Link” single link 40 cm tracks with the extended blades molded in place. But unlike the earlier two kits (StuG III G and Panzer III Ausf. N) they have deleted the set of ice cleats. Technical advice was provided by Tom Cockle and Gary Edmundson. The kit provides three finishing options: Pz.Rgt. 15, 11th Panzer Division, Kharkov 1943 (grey with whitewash patches, white 32); Unidentified Unit, Kharkov 1943 (grey with whitewash patches, red 221); Unidentified Unit, Kharkov 1943 (grey with faded whitewash coating, red L32). All markings are targeted and from Cartograf. Overall this kit provides yet another option for the popular Panzer III series from DML.